On a day commemorating slain civil-rights leader Martin Luther King Jr., the Santa Barbara News-Press responded to The People Organized for the Defense of Equal Rights (PODER) in Santa Barbara's request for a retraction of the word "illegal" from its paper by instead encouraging anti-immigrant hate groups to lead a counter demonstration against PODER's planned day of civil-rights action. 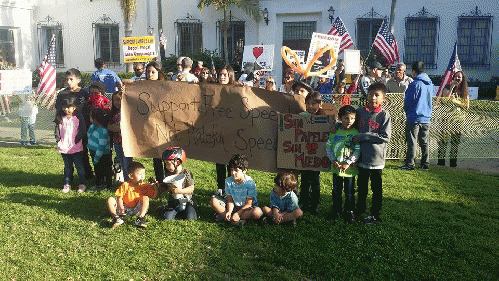 A coalition of community organizers voiced concerns about the state of civil rights fifty years after Dr. King's famous "I Have a Dream" speech and called for a boycott of the Santa Barbara News-Press (SBNP) until it adheres to accepted AP standards for describing Latino immigrants. For their part, the Minutemen and other anti-immigrant hate groups exercised their first amendment rights by hurling racial epithets at PODER activists. The News-Press has tried to paint itself the victim in this dispute by comparing itself to Charlie Hebdo, the French satirical magazine where twelve journalists were killed last month in retaliation for derogatory cartoons of Muhammad. The SBNP compares the spray painting of pro-immigrant language on the front of its building as comparable to the murder of journalists at Charlie Hebdo and argues that its free speech is under attack. Worldwide outrage over the Charlie Hebdo murders prompted much debate on the importance of free speech. But that didn't stop French authorities from arresting controversial comedian Dieudonne for making remarks sympathetic to the killers the day after nation-wide demonstrations for the protection of civil liberties. It turns out the line between free speech and hate speech depends on the race/class standing of the speakers. Vive la France. So what exactly is meant by "free speech" in the age of oligarchs? According to media critic Bagdikian in The New Media Monopoly, five giant media conglomerates - Disney, Viacom, Bertelsmann, News Corporation, and TimeWarner - now own almost all of the world's communication outlets. These include everything from radio, television, movies, and Internet, to books, magazines, and newspapers. News Corporation owner Rupert Murdoch is notorious for using Fox News to advance his right-wing political agenda. The latest instance of Fox's overt racism came shortly after the Charlie Hebdo killings, in which Fox commentator Shanon Bream wondered aloud how police would be able to identify "bad guys" if they had ski masks and "couldn't even know what color," or what "the tone of their skin was?" (click here). Unsurprisingly, a recent study by Politifact found that Fox misinformed its viewing audience 38% of the time (click here). As might be expected in the age of oligarchs and the Supreme Court's McCutcheon decision, "free speech" is one favoring moneyed elites. 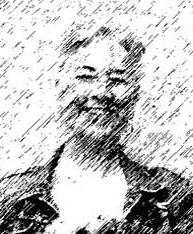 Series: "The Santa Barbara News Suppress"
View All 2 Articles in "The Santa Barbara News Suppress"